** Due to possible weather cancellations or last minute changes to times & locations to the events below, we encourage you to click on the link of the event holder to get the most updated information. The Easter Bunny is paying a very special visit to Catal Restaurant! Guests are invited to feast on a decadent family-style spread of menu offerings like chicken and waffles, crispy bacon, and build-your-own sundae bar while our festive staff makes your own custom mimosa (with a special apple cider cart for the kids). After visiting the Easter Bunny, the Easter hosts will show children to their Easter Baskets filled with fun goodies, including a stuff-your-own bunny, and a complimentary photo print of their magical time. Make your reservation today to enjoy this fun breakfast that is sure to put a smile on every child's face and make memories that will last a lifetime. Brunch with the Easter Bunny is a ticketed event, purchase must be made in advance. Tickets must be purchased online; no payments can be accepted at the restaurant. All You Can Eat Easter Sunday Brunch with Unlimited Champagne Coffee & OJ. Enjoy Scrambled Eggs, Bacon, Ham, Sausage, Bratwurst, Carving Station with Roast Beef, Roasted Pork, Au Jus, Gravy, and Horseradish Sauce, Fried Potatoes, Mac & Cheese, Roasted Vegetables, Fried Potato’s Waffle Bar, European Deli Cold Cuts with assorted Mustards, Imported Cheeses, Salad Bar, Pastry, Danish, Rolls & Bread, Fresh Fruit. Join us this Easter for a Champagne Brunch Buffet filled with activities for the whole family! 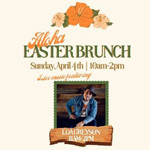 Easter Brunch will begin at 10:00am and conclude at 2:00pm. There will be an Easter egg hunt at 10:30am and 2:00pm with the Easter bunny. Enjoy Easter tradition with your family at Orange County Mining Company. Featuring a traditional Sunday Brunch plus a few extra surprises and dining room dinner service, spend your Easter with your family at Orange County Mining Company. Annual celebration which includes Egg Hunts, Visits with Peter Rabbit, Face Painting, Bounce Houses & Arts & Crafts. Pre-registration for Egg Hunts is required. Enjoy your favorite breakfast specialties along with crafts for kids and mimosas for the adults! The Easter Bunny will be available for pictures during the breakfast and will lead the Easter Egg Hunt! Free spring-themed craft activities for kids from 11am-3pm and the first 150 children will receive a mini Easter Basket with treats. Families can also enjoy free photos with the Easter Bunny. The Anaheim Marketplace invites you to their annual Easter Eggstravaganza on Saturday, April 20th. There will be an easter egg hunt, shows for kids, music, facepainting, games and much more. Free event! Click link above for more information and to register for egg hunt. It's time for Easter Bunny Photos! The public is invited to join North Hills Church for services; 9 & 10:45 a.m. There will be fun activities for the kids, a LIVE worship band and choir, the “Good News” message and Family portraits amongst other things. Activities begin at 9 am - Egg Hunt for kids 12 yrs. and under at noon! Come be a part of the "Egg-citement" this spring at Buena Park's very special Spring Eggstravaganza! Activities include stage entertainment, children's crafts, field games, a petting zoo, moonbounces, visits with the Spring Bunny, and of course, the candy scramble for children 12 years of age and younger. Come early for a special Pancake Breakfast starting at 8:00 am sponsored by the Buena Park Noon Lions. Help celebrate Easter a day early! There will be 2 Easter egg hunts at the OC Fair's Centennial Farm at 11am and 1pm. The first 500 kids will receive an Easter bag for collecting all of their goodies. Be sure to visit our vendors and concession stands for plenty of candy and see the EASTER BUNNY for photos in Hussong's. Join the folks at Ikea Costa Mesa for an Easter Eggstravaganza! Enjoy a Scavenger Hunt, a complimentary meet & greet photo opportunity with the Easter Bunny, and an "egg-cellent" kids craft! Crafts, Face Painting, Activities, Egg hunt for children 4-11, Special Activity Area for ages 0-3 plus visits with the Easter Bunny (Please, don’t forget your camera!). Don't be late, this event starts at 10:30 SHARP! Do you like Peeps? Have you tested the scientific property of Peeps? Candy Peeps are not only a great seasonal holiday treat but a fun way to explore chemistry and science. At the Ocean Institute in Dana Point Harbor, you can test the solubility of peeps, why peeps sink or float, how temperature effects the structure of peeps, and finally make peep slime that you can take home. Ticket includes admission to Ocean Institute for the day Minors must be accompanied by an adult at all times. Hop on down with your family a day before Easter and discover the hidden treasure of candy and plastic filled eggs at Dana Point's spring time Egg Hunts for children up to 10 years of age. There will be two Egg Hunts, one at Pines Park, and one at Sea Canyon Park. Family activities and Easter Bunny visits held from 9:00 am - 10:00 am. Egg Hunt begins promptly at 10am. Don't forget to bring an empty basket to collect the plastic eggs and candy! FREE event for kids of all ages! Carnival games, crafts, egg hunts, and much more! The Egg Hunts will run continuously for ages 11 and under from and much more! The Egg Hunts will run continuously for ages 11 and under from 8:30am-11:00am. Parents are encouraged to remain out of the hunt areas so children can enjoy their own goodies. Please remember to bring your own basket or sack for eggs and treats. This event features egg hunt, carvnival games, bounce houses, crafts, and pictures with the Easter Bunny. Only 300 tickets are available for egg hunt participants. Tickets are $10 for egg hunt (ages 3-10), $2 for spectators. Click link above for hunt times. Tickets can be purchased by phone at (714) 741-5200 or in person at the Recreation Counter in City Hall. The City of Huntington Beach Community Services Department together with the Kiwanis Club of Huntington Beach presents the Easter Hunt and Family Fun Day! Thousands of pounds of candy are given away each year for this special family oriented day! Stop by and hunt for candy, take a picture with the Easter Bunny, play a game at the many game booths, visit the various displays from Community Services, Library Services, Public Works, Fire, and Police, learn about summer camps and classes offered through Community Services, enjoy the live band, and try out some new classes. There will also be a pancake breakfast and the hot lunch made by the Huntington Beach Kiwanis Club. 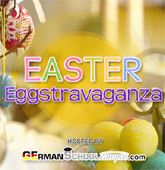 Hosted by GermanSchoolCampus.com, this is a Free Family Easter Event with Traditional Easter Games and activities! Music & Movement, Games, Egg-xtravagant Eggs – Decorate your very own egg utilizing a variety of colorful mediums and materials. Buffet lunch, Egg hunt, and fun! When you arrive at the farm, a tractor pulled wagon will transport you to the hilltop while you take in the view of the farm along the way. Once up top, find a seat and hit the buffet! The friendly Tanaka Farms employees will serve you. Everyone is invited to this free, community event with face painting, Easter Eggs, *food trucks, photo booths, and more! Also, be sure to join us us for our Easter Services (see times below) right after our Egg Scrambles. This event is open to youth ages 7-13 years old. The cost is $10 per child, which includes all activities. Bring your empty basket and a flashlight and get ready for some fun! You MUST pre-register to attend this event. For more information or to register, please visit the Community Center, 101 W. La Habra Blvd., or call 562-383-4200, Monday-Friday, 8:00 a.m.-5:00 p.m.
Activities will include an Eggs-Treme Kid Zone, with games, crafts, inflatables, balloon twisters, live DJ and more. To add to the excitement, eggs for the egg hunt will be dropped by a helicopter! There is a $3 per person fee to participate in the egg hunt. Pre-sale wristbands will be available for purchase at the Community Center prior to the event. The cost to participate on the day of the event is $4 per person. The Easter Bunny will be hoping around! ring your own camera for pictures. Note: There will NOT be an egg hunt at this event. Children's activities include: crafts, games, face painting, entertainment, instructor showcase and "Touch a Truck" where kids will get to climb, work on and "drive" a fun work truck, including trash, fire and Sheriff's Department. PLEASE NOTE: THERE IS NO EGG HUNT AT THIS EVENT! Activities may be canceled if it rains on event day. One egg, two egg, green egg, blue egg. It is time for everyone's springtime favorite, Bunny Blast: A Seuss Eggstravaganza. Enjoy a fun-filled event for the entire family, with a day of activities including game booths, rides, music and other funny things. Bring your own bags or baskets to collect eggs full of candy from a variety of themed egg stations using your free egg station card. Dr. Seuss' first 1,000 young friends can participate in these eggcellent egg stations! Wristband includes: unlimited games, rides and other attractions. Wristbands can be purchased on the day of the event only. $10 wristbands, cash only. It’s springtime and time for the Skatepark to host its annual holiday egg hunt! Come and visit the Skateboarding Bunny, play in the bounce houses, and participate in fun games, and crafts. This is a family-friendly event and great for the young ones! The Park will be closed to riding during this event so it will be safe for all to enjoy. There will be an egg hunt zone for ages 4yrs and under and an all-ages egg hunt zone. This event is limited to 250 participants. The Egg Hunt starts at 11:15 am sharp so please don?t be late or you will miss it! Egg hunt, family style carnival, games and food trucks. Free event which is for children ages 1-14 years and their families. Egg hunts begin at 9:30 and are grouped by age. 1 ticket = .50 cents, tickets may be purchased with CASH onsite. Food will be available for purchase. Hosted by the Recreation and Senior Services Department, this event is free and open to the public. Community members of all ages are invited to participate in some spring-time fun on the Civic Green. City staff will coordinate sack races, various games and most importantly, egg races across the lawn. There will be photo opportunities with the Civic Center bunnies and attendees can enjoy bounce houses, face painting, train rides, popcorn, cotton candy and more. At Irvine Park Railroad's Easter Eggstravaganza, children and adults can ride the train through beautiful Irvine Regional Park. In addition, children can meet and have their photo taken with the Easter Bunny as well as participate in several activities that are located throughout the area. Egg Hunt, games, storytime, crafts, activities and Easter Bunny photos for children 12 and under. Free admission, some activities and food require purchase. Activities include egg hunts, face painting, puppet show, petting zoo, crafts, games, inflatable bounce house and bunny photos. All activities are free! For more information and event schedule please see the attached flyer or call the Community Services Department at (949) 493-5911. Kids and their families are invited to attend this fun, free event! 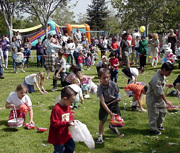 Egg hunts for each age group are provided as well as other activities. Egg Hunt begins promptly at 9:45. Don't forget to bring your Easter Baskets. Easter Egg Hunt Outreach - April 20th at 11:00 am. Free Easter Egg Hunt and family fun!!! Services on Sunday, April 21, 2019 at 10:30 with FREE breakfast for all at 9am! Come enjoy a wonderful pancake breakfast while celebrating the Easter holiday with family and friends in scenic Silverado Canyon. Breakfast will be served from 7:00am-12:00 noon. Breakfast pricing is $6 for adults and $4 for kids. Breakfast is served complete with orange juice, milk, hot coffee, scrambled eggs, sausage, and of course our delicious home-style pancakes made by our beloved Firefighters! THREE Age appropriate Children’s Easter Egg Hunts sponsored by the Silverado Modjeska Recreation & Park District (SMRPD) will take place at 9:30 am, 0-3 yrs, 4-7 yrs and 8yrs+ so every child will have a chance to hunt for as many eggs as they can hold in their basket! Bring your cameras! Activities will include a Candy Walk, Easter Egg Hunts, Resource Fair, Easter Bunny Visits (Parents bring your cameras) and a Pancake Breakfast for $3.50 per person which is sponsored by the Kiwanis Club of Stanton. All Easter Egg Hunts will begin at 10 a.m. for the following age categories: 0-2 years • 3-4 years • 5-7 years • 8-10 years • 11-13 years. Candy will be hidden throughout the egg hunt area. Registration is not necessary. Remember to bring each child a container/ basket for egg hunt goodies. For additional information call (714) 890-4270. Bring a basket or a bag to collect all the treats! There will also be a picturs, petting zoo, entertainment and bounce houses. Egg hunt for kids 9 and under starts at 9 am sharp. Many activities for the whole family at this annual event. The event features live entertainment, delicious food, craft vendors, an extensive resource fair, fun children's activities and of course...a visit from the Easter Bunny. Pre-registration is required. $10 per person. Click above for link to register online. Children 2 - 9 years of age, hop on down to Hurless Barton Park for a day full of fun. There will be crafts, games, petting zoo, face painting and separate egg hunt areas for children ages 2-9 years. Bring your own basket to collect your goodies. This is a free event for the community, so registration is not required. The egg hunt will begin at 10:00am sharp!